We want to simulate a test environment where we may control different possible network problems from within the scope of our (JUnit) test. 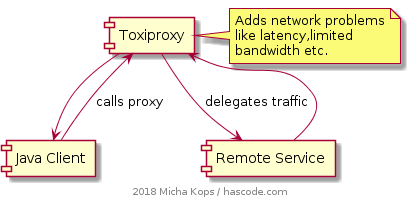 Toxiproxy allows us to create different proxy instances and add so called toxics to them to simulate typical network related problems. A complete list with more detailed information can be found on the project’s documentation here. 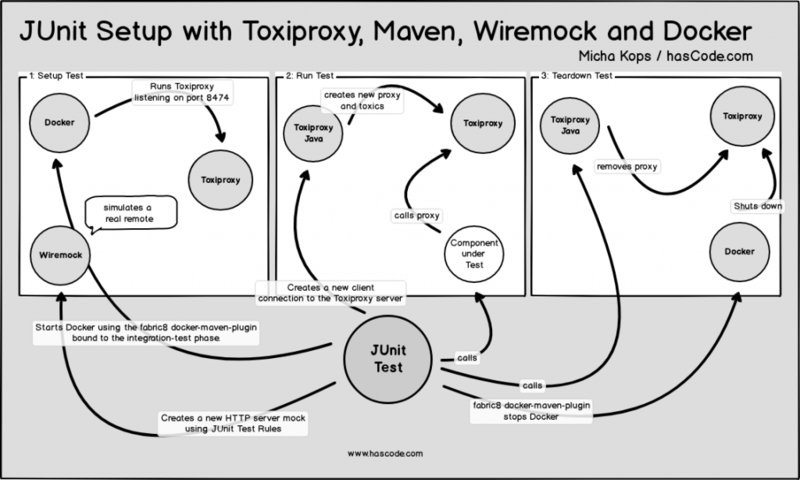 The Toxiproxy Java Client allows us to control a running Toxiproxy server and to create new proxies and add toxics using a Java API. Our application under tests consists of a single client class that communicates with a configurable remote service via HTTP protocol. When not interested in the setup of our application under test, we may skip directly to the test setup. This is our sample REST client. It exposes two methods that we’ll be testing later, one that simply calls a remote service and prints the duration of the operation. The other method sends a specified amount of data to a remote service and again prints the duration. We’re using the new HTTP Client added in Java 9 here. Now that we have a sample application we’re ready to create a setup to test the behavior of the application when dealing with network related problems. To control the startup and shutdown of the Toxiproxy server and to bind it to the testing lifecycle, we need to add the following plugin references and configurations to our pom.xml to achieve that..
Now we may finally write our integration tests..
Before our tests run, we’re starting a new Wiremock instance, this is done using a simple TestRule. In addition we’re creating the client connection to the ToxiProxy server. In our second test setup we want to test the behavior of our application when it is forced to deal with limited bandwidth .. e.g. 1.5Mbit upstream. [INFO] DOCKER> [shopify/toxiproxy:latest] "it-toxiproxy": Waiting for ports  directly on container with IP (). Now I may use the toxiproxy-cli binaries that reside in /go/bin. Proxy has no Upstream toxics enabled. For more detailed information, please feel free to consult the Toxiproxy documentation. “[ERROR] Failed to execute goal org.apache.maven.plugins:maven-compiler-plugin:3.1:testCompile (default-testCompile) on project: Fatal error compiling: invalid target release: 1.9 -> [Help 1]“ With Java 9 the new version-string-scheme has changed and therefore 1.9 is not valid. For more details, please consult the following announcement from Oracle.
. Adam Bien has written a nice article about using the Java 9 HTTP client with JUnit and Maven here. This entry was posted on Sunday, July 29th, 2018 at 8:42 pm	and is filed under Java, testing. You can follow any responses to this entry through the RSS 2.0 feed. You can skip to the end and leave a response. Pinging is currently not allowed.